A couple of years ago I got back from a trip to the UK and a few hours later was out photographing a festival in the Botanic Gardens. Unfortunately I had been en route and had missed the far superior line-up of the first day of Sunset Sounds but getting out of the house to photograph the weaker second day still showed itself to be a good way of beating jetlag, even if it was a fairly unpleasant day of heavy rain and mud in the lead up to the January 2011 flooding in Brisbane. Fast forward two years and I find myself getting back to Brisbane the day before heading down to the Gold Coast to photograph the Big Day Out. Although I’ve afforded myself a day to get over the worst of jetlag, it’s a much tougher prospect than last time, as it involves the added burden of travelling to and from the Gold Coast, plus a quick turnaround deadline to provide photos the following day, neither of which I had last time. Indeed it is a really long and arduous day. The cause isn’t helped by all my files disappearing when transferring them to an external hard drive. This happens at about 2am after I’ve been through everything three or four times to select the best/my favourite photos and have done the initial editing. After a very stressful 15 minutes I manage to recover everything but find that the star ratings used to shortlist the photos for the gallery and all the editing has vanished. All up about 2 hours’ worth of work has been lost. It’s the very last thing you want to discover at 2am when you’ve had a really long day on site and have jetlag from a 25 hour trip back from the UK. The only thing to do is to start again, although in the end I have to call it a night due to extreme exhaustion and leave more work than I would have liked until later the following morning, when I’ve had a few hours more sleep. It seemed to be a slightly different audience than in recent years and a better one too, at least one that abused me less as I walked by with my camera. There were a whole lot less Southern Cross flags/clothes/tattoos on display than normal, or at least on obvious display. Then again, maybe I just spent too much time in the media tent away from the masses. After all, the train journey down was the same as ever and there were already unconscious people at Helensvale train station by 10am. After last year, it was a surprise just how busy this year’s event. Maybe this is the result of getting a few more crossover mainstream acts high up on the bill (Red Hot Chilli Peppers, The Killers), bands who get way more play on commercial radio than they would on triple j but who could still be accepted by the triple j crowd. Looking back on the day, there weren’t that many highlights. I really enjoyed photographing Death Grips, it was good to finally get to photograph the Yeah Yeah Yeahs and, after all these years to finally see the Red Hot Chilli Peppers, even if it’s more than 20 years too late. Equally, there weren’t too many lowlights, other than the overall unexciting line-up (which was obviously known well in advance) and most of the headline acts playing with terrible lighting. Photos from the day coming up in the next series of posts. This entry was posted on Wednesday, April 17th, 2013 at 8:41 am. 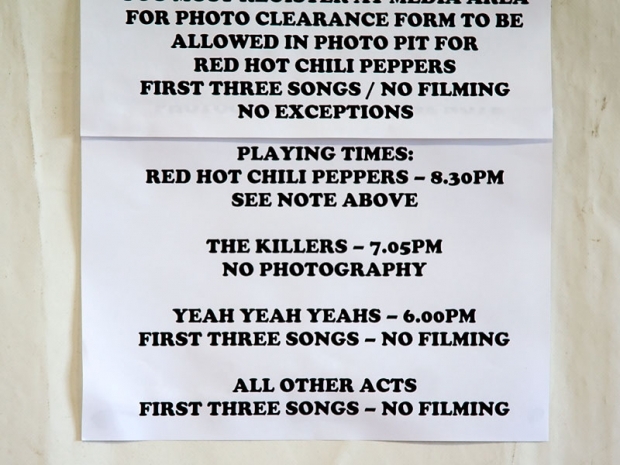 It is filed under Music Photography and tagged with 2013, BDO, BDO2013, Big Day Out 2013, Death Grips, Gold Coast Parklands, Red Hot Chilli Peppers, Yeah Yeah Yeahs. You can follow any responses to this entry through the RSS 2.0 feed.